WELLINGTON, Fla. - February 6, 2016 - Palm Beach Illustrated/Technogym knew they had their work cut out for them if they were going to ride home with the Joe Barry trophy. 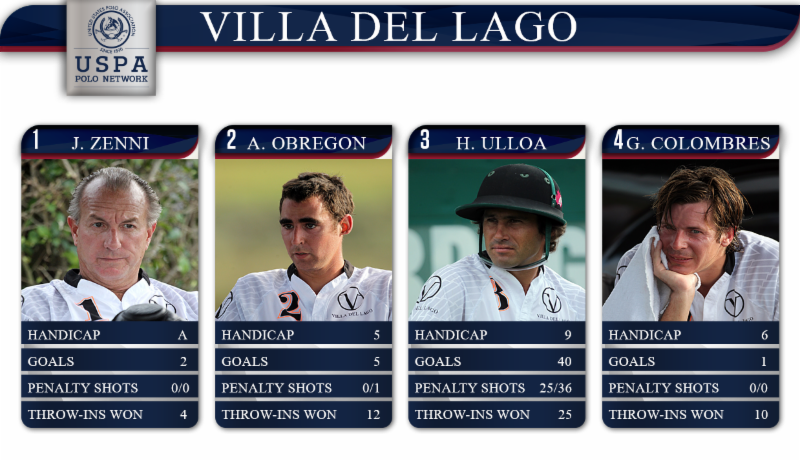 The last time the young, talented team faced off against venerable Villa del Lago in the 20-goal tournament at the International Polo Club Palm Beach (IPC), they lost by a single goal. The only hope of winning the final hinged on the same hurdle as before: Hilario Ulloa. As he had in the previous matchup, Ulloa made all but two of his team's goals in the final. This time, however, Palm Beach Illustrated/Technogym pulled off one of the most astounding last-gasp wins ever. With just six seconds left on the clock, a flawless triple-handoff from his teammates delivered the ball to Nacho Badiola, who ran it into goal as those the devil were on his heels. "All I was thinking in those last seconds was put it in, put it in," said Badiola. "I couldn't believe that I scored the winning goal." 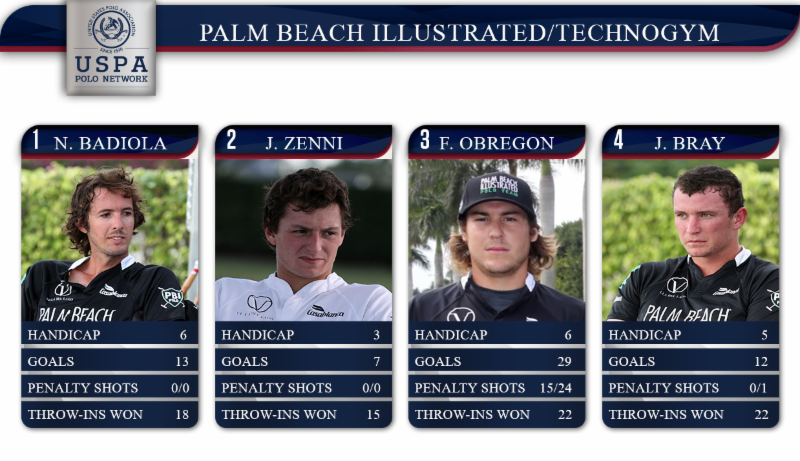 Palm Beach Illustrated/Technogym had been playing catch-up since the top of the fifth, when Villa del Lago led by five (12-7). Just 30 seconds before Badiola's winning shot, Ulloa tied the game at 13 and then, with 37.8 seconds left on the clock, won the final throw-in. He hurtled the ball downfield, but before any white jerseys could react, Jesse Bray (who, along with teammate Jared Zenni, is a Team USPA member), swooped in. He sent the ball on an open back shot to Obregon, who looked up and saw Badiola downfield perfectly positioned for the attack. Obregon passed him the ball and ran interference while Badiola went for broke, running the ball into goal. Obregon was named MVP, and Ulloa's pony, Nobel, was selected as Best Playing Pony. The Joe Barry Cup Final was live streamed by ChukkerTV, a partner of the USPA Polo Network. It will also carry continuous live coverage of the 20-goal Ylvisaker Cup, which resumed Saturday, Feb. 6 at 11 a.m. EST., with Audi/Millarville opposing White Birch at IPC. Ylvisaker coverage continues Sunday, Feb. 7 at 3 p.m. EST (5 Star Builders/Horseware/Tackeria v. La Indiana). For live, continuous coverage: visit the USPA Polo Network powered by ChukkerTV.